Tesser & Cohen's practice centers on its specialization in the multi-faceted field of construction law.· Representing clients in the construction business is a field of legal practice that has grown significantly in the past 25 years and requires an understanding of each phase of the construction process. Tesser & Cohen has a broad range of experience in representing public and private owners, contractors, subcontractors, design professionals, and developers during the planning and design phase, financing, contract negotiation, dispute resolution, and litigation. We represent clients on projects of all sizes and complexities, public and private, from residential developments to high-rise corporate buildings, shopping centers, and other commercial, industrial, and retail projects. We have practiced extensively in both New York and New Jersey and keep abreast of evolving case law and changing statutes, including the lien laws in both states. A thorough understanding of this area of the law allows us to offer contractors, subcontractors, and suppliers who have provided labor and materials with the security that often eludes them. Handling bid protests on public projects, which involves expedited court proceedings, requires specialized knowledge and experience. At Tesser & Cohen we have both. Our daily attention to this constantly evolving field allows us to remain current with recent court decisions, legislative enactments, and legal trends, all of which translate into effective advocacy on behalf of our clients. Construction claims generally present legal issues that we are uniquely qualified to address. We have the ability to work closely with experts to assure that they articulate their views in a manner that is understandable to laymen, including those who serve as jurors. Tesser & Cohen is experienced in analyzing, defending against, and prosecuting claims for damages that commonly arise out of construction projects, including delay, constructive acceleration, cost overruns and change orders, extended overhead, differing site conditions, defective work, cost escalation, lost profit, and wrongful termination. The causes of these problems range from lack of communication on the project to an inadequately defined scope of work, poor selection of subcontractors and management, and an overall inexperience with the construction process. In each of these areas we can offer expert insight and analyses that are well beyond the reach of the general practitioner of law. Our ability to assess the complex facts behind construction disputes quickly and accurately and to provide counseling and guidance at the contract negotiation stage throughout the course of the project often results in dispute avoidance and expedient dispute resolution for our clients. If litigation is the only alternative, Tesser & Cohen represents clients in trial and appellate courts, arbitration forums, and before local, state, and federal government agencies. Tesser & Cohen also specializes in the expansive field of Surety Law. We have the expertise to prosecute a claim against a performance or payment bond, or to defend a surety from claims. 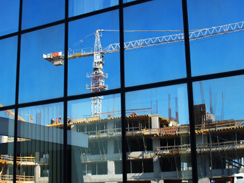 Defaulted contractors, notice requirements, municipal and public liens, and Miller Act claims all present unique issues for the Construction Law practitioner. As specialists in the field of construction, we can be a valuable asset throughout the construction process, ensuring that the legitimate interests of our clients are protected.